Angela Davis stands outside Royce Hall, where she will give a public lecture on May 8. 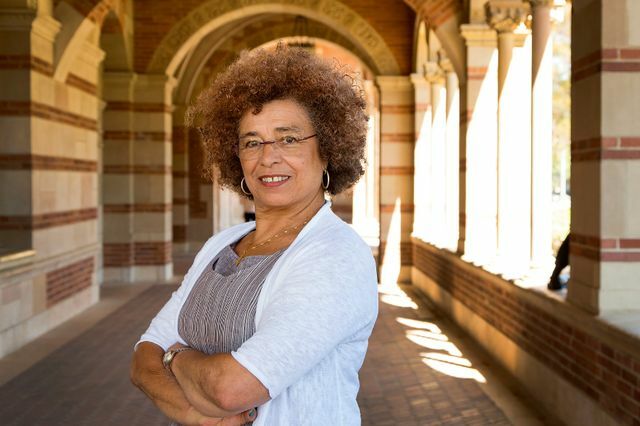 When a young Angela Davis taught her first college course at UCLA 45 years ago, it was a different world, said the emerita professor, looking back at the episode that became a defining moment in her academic career. Because Davis was a member of the Communist Party, the UC Board of Regents, at the urging of then-Gov. Ronald Reagan, tried to fire her before she even taught her first class. But enraged UCLA faculty, staff and students protested in support of Davis, citing academic freedom. A lawsuit also was later filed in Davis’ defense. Davis was allowed to teach a course that, for the opening lecture, had to be moved from the Dickson Art Center to Royce Hall to accommodate more than 2,000 students and others who wanted to attend. A request for television cameras to broadcast the lecture was denied, but the controversy still made the national evening news. She taught that course as well as two others at UCLA during the 1969-70 academic year. Forty-five years later, Davis has returned to teach a class at UCLA for the first time since that tumultuous year. But this time, there’s far less fanfare. Davis, whose official title is Distinguished Professor Emerita, is a Regents’ Lecturer at UCLA this spring quarter. She’s teaching a graduate seminar in gender studies and will also deliver a public lecture at 5:30 p.m. on May 8 in Royce Hall, the very place that launched her onto an international stage. 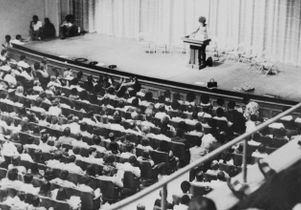 Angela Davis, then acting assistant professor of philosophy, taught her first class at Royce Hall Oct. 6, 1969. The UCLA Department of Gender Studies nominated Davis as a Regents’ Lecturer because several of its professors and graduate students had expressed an interest in her return, said Jenny Sharpe, the department’s chair and professor of English and comparative literature. "Since the Board of Regents fired her in 1970 for her radical politics, and UCLA defended her on the basis of academic freedom, we thought it would be poetic justice for her to return to UCLA as a Regents’ Lecturer," Sharpe said. Davis views the year she spent at UCLA as a pivotal point in her life. “It was here that I had my first real job so that will always be a kind of a milestone,” she said. “Of course, now I can say that UCLA stands at the beginning of a trajectory that has brought me to this very moment. 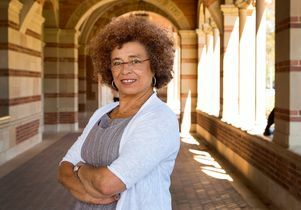 “I cannot imagine my life other than in that trajectory that was initiated here at UCLA,” said Davis, who still sports her signature Afro. Davis’ graduate seminar, titled "Critical Theory and Feminist Dialogues," includes 25 students from different academic disciplines — gender studies, Chicano and African-American studies, political science, history and library science. Her course touches on feminism and African-American history as well as current debates on racism and inequality. Davis said she’s impressed by students in her class. She’s also proud that some of her former UC Santa Cruz students are now teaching at UCLA. They include Michelle Erai, an assistant professor of gender studies; Maylei Blackwell, an associate professor of Chicana and Chicano studies; and David Delgado Shorter, an associate professor of world arts and cultures. While the UC system has changed for the better since the 1970s — Davis noted that there are now ethnic studies and other diversity-related programs systemwide that didn’t exist back then — there are other trends that worry her. The UC and other institutions of higher education must continue to discuss what can be done to increase the number of students of color, she added. Davis is also a staunch advocate of prison abolition and supports efforts to dismantle the current prison system in the United States. Davis has traveled the country and the world to criticize a prison system that she and others say disproportionately incarcerates people of color. She notes that women of color are the fastest-growing segment of the prison population. “We have reached a point where even conservatives are acknowledging that mass incarceration is not working,” said Davis, who, shortly after being dismissed from UCLA, was arrested for allegedly conspiring in the abduction and death of a Marin County prison guard. She was tried and found not guilty, but her experience in jail inspired her to advocate for prison abolition, she said. “The question is not only about attempting to persuade judges and other people in authority not to sentence so many people to prison, but it’s about disrupting the relationship between corporations and corrections and law-and-order ideology and anti-drug ideology,” she added. Davis’ place in the history of the university and, in particular, in the history of African American studies at UCLA, is visible to all who go to the homepage of the campus’s newest department, created just last month. Davis will lecture about feminism and the prison abolition movement on May 8. Tickets are no longer available through the UCLA Central Ticket Office. Students, staff, faculty, and the public can wait for standby tickets at Royce Hall beginning at 4:30 p.m. 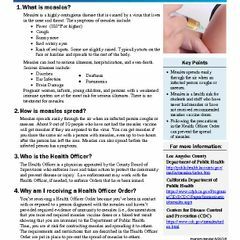 Standby priority will be given to current UCLA students with a valid Bruincard.